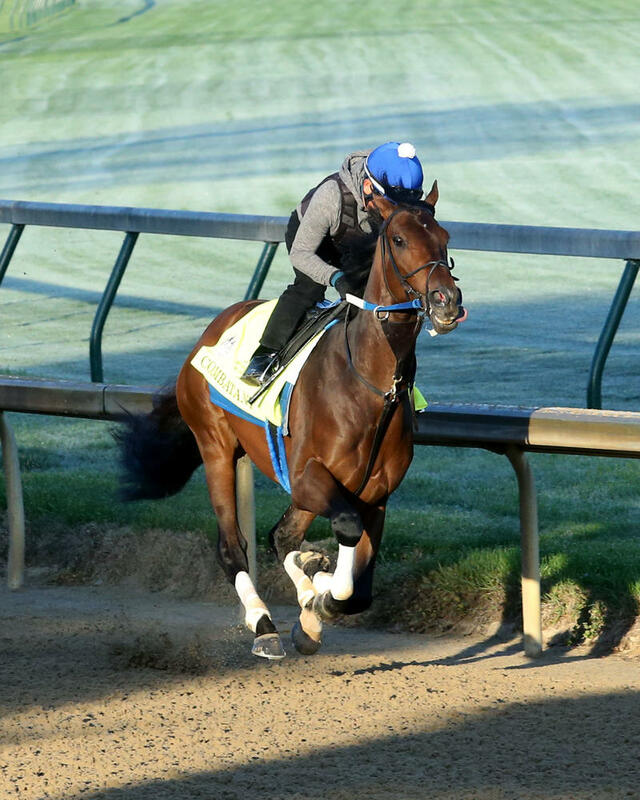 LOUISVILLE, Ky. (Monday, April 30, 2018) – Winchell Thoroughbreds and Willis Horton Racing’s Combatant completed his major preparation for Kentucky Derby 144 (Grade I) by working a half-mile in :49.60 on a brisk Monday morning at Churchill Downs. Fourth in the Arkansas Derby (GI) in his most recent start, Combatant was partnered in the work by Angel Garcia for trainer Steve Asmussen. By day’s end, the entire cast for the Kentucky Derby was expected to be on the grounds. Firenze Fire arrived at 3:50 a.m. by van from New York and Enticed arrived before noon by van from Florida. Arriving mid-afternoon from California were likely Derby favorite Justify, stablemate Solomini and Bolt d’Oro. The cast was scheduled to be completed late this afternoon with the arrival of UAE Derby (GII) winner Mendelssohn. A total of 14 fillies were entered Monday morning for the 144th running of the $1 million Longines Kentucky Oaks (GI) with Monomoy Girl being made the 2-1 morning-line favorite by Churchill Downs linemaker Mike Battaglia. Midnight Bisou is the 5-2 second choice. AUDIBLE/MAGNUM MOON/NOBLE INDY/VINO ROSSO – The four stakes winners from the Todd Pletcher barn went trackside Monday as a group to take advantage of the cleared racetrack during the 7:30 to 7:45 special training period for Derby and Oaks runners. It was a bright, sunshine-filled morning full of crisp air and the Pletcher charges – as they almost always do – sparkled with good looks and good health. Audible, the Florida Derby (GI) champ, had regular exercise rider Amelia Green in the tack; Arkansas Derby (GI) star Magnum Moon was partnered by Nick Bush; Louisiana Derby (GII) hero Noble Indy went with Carlos Cano, and Wood Memorial (GII) ace Vino Rosso was piloted by Adele Bellinger. They all went through the six-furlong gap and backtracked past the finish line before turning to begin their gallops, which went with good energy for between a mile and three-eighths and a mile and a half. Pletcher looked on from trackside and liked what he saw. The seven-time Eclipse Award winner as America’s top trainer was asked if any of the quartet had any quirks or habits that separated him from the others. BLENDED CITIZEN – Greg Hall and SAYJAY Racing’s Blended Citizen jogged on the main track at Keeneland Monday under Jonny Garcia for trainer Doug O’Neill. No. 21 on the Kentucky Derby leaderboard, Blended Citizen was scheduled to leave Keeneland at 10:30 this morning for the short van ride to Churchill Downs. Kyle Frey has the mount on Blended Citizen if he makes the 20-horse field. BOLT D’ORO –Ruis Racing LLC’s Bolt d’Oro was scheduled to arrive at Churchill Downs Monday afternoon following a flight from Southern California. Trainer/owner Mick Ruis, who spent the past two days inspecting his newly purchased farm in Lexington, arrived at Churchill Downs earlier in the day to welcome the son of Medaglia d’Oro. BRAVAZO – Calumet Farm’s Bravazo returned to the track two days after posting his final breeze and galloped 1 ½ miles under Danielle Rosier. The Awesome Again colt, who could give Hall of Fame trainer D. Wayne Lukas his fifth Kentucky Derby win, also schooled in the paddock. COMBATANT – Winchell Thoroughbreds and Willis Horton’s Combatant, who was not worse than fourth in four prep races this spring at Oaklawn, completed his major Kentucky Derby preparations by breezing a half-mile in :49.60 and galloping out five furlongs in 1:03.80 Monday under Angel Garcia. “It went well,” trainer Steve Asmussen said. “He’s spent a lot of time training here, so he’s comfortable with the surroundings. I thought he put in a very typical breeze for the week of the race. While he hopes Combatant draws outside Tuesday, Asmussen said he wouldn’t be disappointed to draw the inside after finishing second last year with Lookin At Lee, who had drawn the rail. ENTICED – Godolphin LLC’s Enticed arrived at Churchill Downs mid-morning Monday following a van ride from Belmont Park. The Kiaran McLaughlin-trained colt, who was accompanied by stablemate and Kentucky Oaks entrant Take Charge Paula, will be sent to the track at 9 a.m. to continue his preparation for a scheduled start in Saturday’s Kentucky Derby. “Enticed will gallop the next four days, but he will go out at 9 because we only have one (exercise) rider,” said McLaughlin, noting that Take Charge Paula will gallop during the designated period for Kentucky Derby and Kentucky Oaks horses. McLaughlin is scheduled to arrive in Louisville Monday evening. FIRENZE FIRE –– Mr. Amore Stable’s Firenze Fire arrived at Churchill Downs at 3:50 a.m. Monday following a van ride from Belmont Park. Owner/breeder Ron Lombardi arrived at Churchill Downs a few hours later and was pleased to see a happy colt in Stall 22 of Barn 41. “He’s bright and alert. It looks like he had a good trip,” said Lombardi, who owns a chain of 70 physical therapy centers in New York, Florida and New Jersey. Firenze Fire will be Lombardi’s first Kentucky Derby entrant. “It’s a dream come true. Since I got into horse racing, it’s been my goal to make it to the Derby. I never thought it would happen, especially with a homebred. That’s what’s amazing,” said the Winter Park, Florida and Mountain Lakes, New Jersey resident, who owns 60 horses, including 13 broodmares, 12 weanlings, seven yearlings and eight 2-year-olds. Firenze Fire is out of My Every Wish, a Langfuhr mare whom he claimed for $16,000 and ran twice before being retired because of a breathing problem. “I’m going back to Poseidon’s Warrior with My Every Wish to see if I can strike lightning twice,” Lombardi said. Lombardi expected trainer Jason Servis to arrive at Churchill Downs later Monday. FLAMEAWAY – Flameaway’s regular exercise rider, Chris Garraway, has been involved in the horse racing industry for around 45 years, but never had ridden a horse preparing for the Kentucky Derby before he started getting on the chestnut colt owned by John Oxley. Garraway, a native of Trinidad and Tobago, began working for trainer Mark Casse in 2016, and says Flameaway is the best horse he has ever ridden. Flameaway jogged one lap around the track this morning with Garraway aboard during the 7:30-7:45 training period for Oaks and Derby Horses, ponied by Casse assistant Nick Tomlinson. Casse said Flameaway will gallop tomorrow. FREE DROP BILLY/PROMISES FULFILLED – Albaugh Family Stables’ Free Drop Billy and Robert Baron’s Promises Fulfilled jogged one mile Monday morning at 7:30 for trainer Dale Romans. Both horses are stabled in Barn 4 at Churchill Downs. GOOD MAGIC – Last year’s Eclipse Award-winning Champion 2-Year-Old Male, owned by e Five Racing Thoroughbreds & Stonestreet Stables LLC, “trotted once around the track” this morning with regular exercise rider Walter Malasquez aboard, according to two-time Eclipse Award-winning trainer Chad Brown. “He was moving very, very well,” Brown said. “He bounced out of his work and I’m real happy with this horse.”One advantage that Good Magic seems to have over a few of the other leading Derby candidates is his experience in both tight quarters and full fields. With 2017 Eclipse Award-winning jockey Jose Ortiz piloting, Good Magic split horses en route to winning the Breeders’ Cup Juvenile (GI) at Del Mar in a field of 12 and negotiated a full field of 14 in the Blue Grass Stakes (GII) at Keeneland. HOFBURG – Juddmonte Farms Inc.’s homebred Florida Derby (GI) runner-up Hofburg had an easy morning walking the shedrow at Barn 19, the same Churchill Downs barn that Hall of Fame trainer Bill Mott has been in for 38 years. Mott reported he was pleased with how Hofburg looked the morning after a half-mile work. Hofburg is the lone Derby horse with only two starts as a 3-year-old. Unlike favored Justify, though, the Tapit colt debuted as a 2-year-old, finishing an even fourth in a one-turn Saratoga maiden race before being sidelined by minor injuries Mott described as “baby issues.” A late-summer sprint might not seem that consequential to a horse’s Derby chances, but Mott believes it is better than being unraced at 2, the scenario known as the “Curse of Apollo,” referring to the last Derby winner, in 1882, who didn’t record a start at 2. Hofburg is named for the Vienna palace and surrounding neighborhood that is the official residence of the President of Austria. Built in the 13th century, the Hofburg was the seat of power of the Hapsburg dynasty and the Holy Roman Empire. INSTILLED REGARD – OXO Equine LLC’s Kentucky Derby sponsored by Woodford Reserve (GI) contender Instilled Regard is currently bound for Louisville, Kentucky, on a flight that is expected to land at 12:30 p.m. assistant trainer Dan Ward, second in command to Hall of Famer Jerry Hollendorfer, confirmed that information Monday morning. The Grade III winner will take up residence in the same Barn 41 that saw fellow Hollendorfer pupil Battle of Midway prepare for an eventual third-place finish in last year’s Run for the Roses. JUSTIFY/SOLOMINI – Hall of Fame trainer Bob Baffert’s Derby duo of China Horse Club International Ltd., Head of Plains Partners, Starlight Racing & WinStar Farm LLC’s Justify and Zayat Stables LLC, Mrs. John Magnier, Michael B. Tabor & Derrick Smith’s Solomini were en route to Churchill Downs after leaving Santa Anita Park early Monday morning. Following a flight from Southern California to Louisville, the Santa Anita Derby (GI) winner and Breeders’ Cup Juvenile (GI) runner-up are expected at Churchill Downs around 1:45 p.m. ET. According to the H.E. Tex Sutton Forwarding Company flight tracker, Kalitta Charters Flight 725, a modified Boeing 727, departed Ontario (Calif.) International Airport at 6:50 a.m. PDT for a three-hour and 28-minute flight. LONE SAILOR – G M B Racing’s Lone Sailor galloped 1 ½ miles with exercise rider Maurice Sanchez up at 5:30 a.m. Monday for trainer Tom Amoss. MENDELSSOHN – Michael B. Tabor, Mrs. John Magnier and Derrick Smith’s Kentucky Derby contender Mendelssohn is en route to Louisville, Kentucky, from his Ballydoyle base in County Tipperary, Ireland on Monday morning. The earner of $1,961,137 is expected to land around 5:30 p.m. ET. 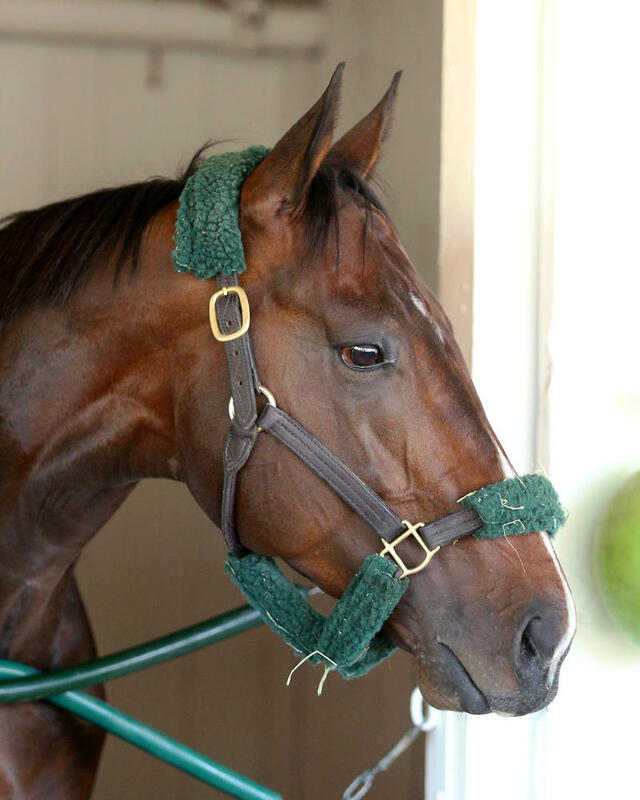 He will immediately enter quarantine in Barn 17 and is expected to clear in time to train on Wednesday morning. Victorious over three surfaces in as many previous starts – on dirt in the UAE Derby (GII), all-weather in the Patton Stakes (Listed) and grass in the Breeders’ Cup Juvenile Turf (GI) – the half-brother to four-time champion Beholder is joined on his flight by Grade I winner Deauville, Group II winner War Decree and multiple stakes-placed Threeandfpourpence. The first two appear likely for the Old Forester Turf Classic (GI), while the last named is a candidate for the American Turf (GII). Both races are on the Kentucky Derby undercard. MY BOY JACK – Don’t Tell My Wife Stables, Monomoy Stables and West Point Thoroughbreds’ multiple stakes winner My Boy Jack galloped a bit more than a mile Monday morning under regular exercise rider Peedy Landry during the special training period for Derby and Oaks runners. The sleek, near-black colt by Creative Cause went about his business in good fashion and drew a nod of approval from trainer Keith Desormeaux. My Boy Jack registered his initial victory in the Zuma Beach Stakes at Santa Anita last October, then followed that up by being beaten only three lengths in the Breeders’ Cup Juvenile Turf (GI) at Del Mar in November. He’s run in four stakes this year, winning two and running second and third in the others. When he competes next on Saturday in Kentucky Derby 144, it will be his 11th start, the most by any runner in the projected 20-horse field. Trainer Desormeaux will give his brother Kent a leg up in the Run for the Roses and it will be the eighth time the Hall of Fame jockey has handled the stretch-running colt. SHAPING UP: THE KENTUCKY DERBY – Likely starters in the 144th running of the $2 million, Grade I Kentucky Derby Presented by Woodford Reserve to be run for 3-year-olds at 1 1/4 miles on Saturday, May 5: Audible (jockey Javier Castellano), Bolt d’Oro (Victor Espinoza), Bravazo (Luis Contreras), Combatant (Ricardo Santana Jr.), Enticed (Junior Alvarado), Firenze Fire (Paco Lopez), Flameaway (Jose Lezcano), Free Drop Billy (Robby Albarado), Good Magic (Jose Ortiz), Hofburg (Irad Ortiz Jr.), Instilled Regard (Drayden Van Dyke), Justify (Mike Smith), Lone Sailor (James Graham), Magnum Moon (Luis Saez), Mendelssohn (Ryan Moore), My Boy Jack (Kent Desormeaux), Noble Indy (Florent Geroux), Promises Fulfilled (Corey Lanerie), Solomini (Flavien Prat), Vino Rosso (John Velazquez). Next up in order of preference: Blended Citizen (Kyle Frey), Restoring Hope (TBA), Sporting Chance (TBA), Givemeaminit (TBA) and Pony Up (TBA). CHOCOLATE MARTINI – Double Doors Racing’s Fair Grounds Oaks (GII) winner Chocolate Martini galloped 1 ½ miles Monday morning for trainer Tom Amoss. CLASSY ACT/PATRONA MARGARITA – Classy Act and Patrona Margarita continued their early-morning schedule when they galloped 1 1/2 miles Monday for trainer Bret Calhoun. Brian Hernandez Jr. picks up the mount on Classy Act (15-1 morning line) and will break from post position three while Ricardo Santana Jr. has the call on Patrona Margarita (30-1) and will break from post position 12. COACH ROCKS – Roddy Valente, RAP Racing and West Point Thoroughbreds’ Coach Rocks galloped 1 ½ miles Monday morning at 7:30 for Churchill Downs’ all-time leading trainer Dale Romans. ESKIMO KISSES – Magdalena Racing, Gainesway Stable and Harold Lerner’s Eskimo Kisses jogged one mile and galloped one mile under exercise rider Mario Conbento for trainer Ken McPeek. The Ashland (GI) runner-up drew post position 13 for Friday’s Kentucky Oaks and is 15-1 on the morning line. HEAVENHASMYNIKKI – Loooch Racing Stables’ Heavenhasmynikki galloped an easy mile and a half under Jake Radosevich Monday morning during the 7:30-7:45 training window for Oaks and Derby horses. Trainer Anthony Quartarolo said that Calvin Borel, who rode Rachel Alexandra to a dominating victory in the 2009 Kentucky Oaks, would have the mount on Heavenhasmynikki. “That was (owner) Ron Paolucci’s decision,” Quartarolo said, noting that Borel may get acquainted with the filly one morning before the Oaks, possibly Wednesday. The Ohio-bred daughter of Majestic Warrior has not started since finishing third in the March 3 Davona Dale (GII) at Gulfstream Park. “She had a pinched muscle that caused her to miss the (Gulfstream Park) Oaks (GII),” Quartarolo said. “We gave her some time and so far, so good. I think she will like two turns and eventually I want to get her on grass. Listed at 30-1 on the morning line, Heavenhasmynikki drew post position eight, a spot that pleased Quartarolo. “That’s a good spot. I was hoping we would not be far outside in a big field,” Quartarolo said. MIDNIGHT BISOU – Allen Racing and Bloom Racing Stable’s triple stakes winner was part of a contingent of California stakes horses heading east Monday morning with touchdown planned in Louisville and Churchill Downs’ backstretch Monday afternoon. The Midnight Lute filly, who’ll be one of the favorites for Friday’s $1 million, Grade I Kentucky Oaks, has won the Santa Ynez (GII), the Santa Ysabel (GIII) and the Santa Anita Oaks (GI) – all at Santa Anita – this year, in each case partnered by Hall of Fame rider Mike Smith, who’ll get a leg up once again in the nine-furlong filly classic. Midnight Bisou’s trainer, the veteran Bill Spawr, also was flying to Louisville Monday, though he was on a commercial flight. MONOMOY GIRL/SASSY SIENNA/KELLY’S HUMOR – Several hours before drawing posts 14, 1 and 6, respectively, Monomoy Girl, installed as the 2-1 morning-line favorite, Sassy Sienna and Kelly’s Humor went out and jogged one mile in tandem during the special 7:30 a.m. time reserved for just Oaks and Derby horses. It was their first trip to the track since completing their final works Saturday. Trainer Brad Cox was philosophical about drawing the rail and outer most post with two of his fillies, which was a 90-1 shot, TwinSpires’ Ed DeRosa announced at the draw. “It is, what it is,” Cox said. “We’ll come up with a game plan and run the play. It is what it is. It’s horse racing. “Monomoy Girl is a good filly and good horses overcome things. We have to overcome the 14 hole. Obviously, we’ll have the speed to the inside of us. Hopefully, she can adjust. I think we learned as much about her in the (Feb. 17) Rachel Alexandra Stakes (GII) than any other race. She broke from the outside post that day. Obviously, there wasn’t 14 horses, but she broke a little slow and was able to adjust to the pace. It’s not where we want to be, but she’s a good horse and hopefully she can overcome. She’s ready to run, so hopefully she can get a good trip. While Monomoy Girl and Sassy Sienna secured their spots in the Oaks early by winning the Ashland Stakes (GI) at Keeneland and Fantasy Stakes (GIII) at Oaklawn in their most recent starts, respectively, Cox did not know if Kelly’s Humor, who was second in Keeneland’s Beaumont Stakes (GIII) in her only start this year, would make the 14-horse field until entry time. MY MISS LILLY – Trainer Mark Hennig was back at Churchill Downs this morning to watch Courtlandt Farms’ My Miss Lilly jog two miles at 6:30 with exercise rider Emerson Chavez, ponied by Monnie Goetz and Bucky. Hennig’s wife Rosemary oversaw the filly’s training while he was in New York. “We gave her a lighter day because she was pulling pretty hard yesterday,” Hennig said about My Miss Lilly’s previous day 1 1/8-mile gallop. Hennig has been patient with My Miss Lilly, who enters the Kentucky Oaks with just four lifetime starts, including a victory in her last race, the 1 1/8-mile Gazelle (GII) at Aqueduct April 7. “She was about ready to run coming into Saratoga, and then we had a little setback and ended up freshening her and giving her time, which probably turned out to be the best thing for her,” Hennig said. My Miss Lilly is one of only two fillies in the field to have won at the 1 1/8-mile distance of the Kentucky Oaks within the United States. The other is Wonder Gadot. My Miss Lilly drew post position 11 for the Kentucky Oaks. RAYYA – Sheikh Rashid Bin Humaid Al Nuaimi’s UAE Derby (GII) runner-up Rayya was en route to Louisville after leaving trainer Bob Baffert’s Santa Anita Park base early Monday morning. 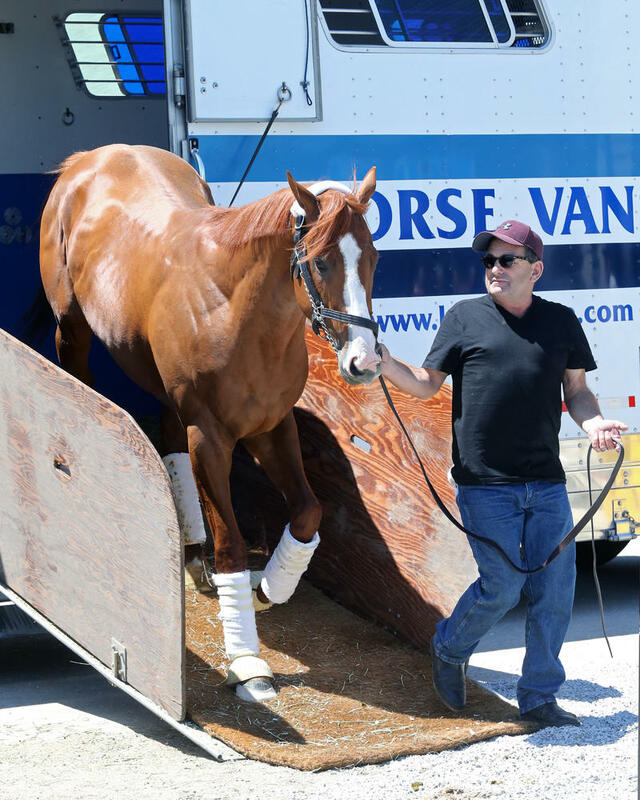 Following a flight from Los Angeles to Louisville, Baffert’s Oaks and Derby contenders are expected at Churchill Downs around 1:45 p.m.
Rayya drew post No. 7 for the Oaks, is 15-1 on the morning line, and will be ridden by Drayden Van Dyke. TAKE CHARGE PAULA –- Peter Deutsch’s Take Charge Paula arrived at Churchill Downs by van from Belmont Park mid-morning Monday, accompanied by stablemate and Kentucky Derby candidate Enticed. “All’s good. 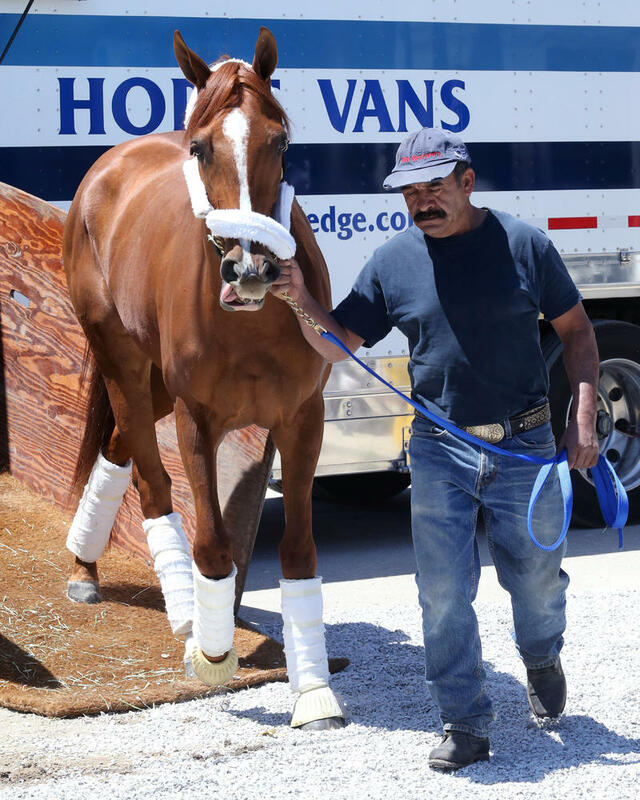 They both arrived feeling great,” said trainer Kiaran McLaughlin, who is scheduled to arrive in Louisville Monday evening. Take Charge Paula settled in her stall in Barn 41 and is scheduled to go to the track Tuesday morning in preparation for a start in Friday’s Kentucky Oaks. “She’ll gallop the next three days and she’ll go at the designated time for the Oaks and Derby horses,” McLaughlin said. Take Charge Paula drew the No. 9 stall in the Oaks starting gate during Monday’s post position draw. WONDER GADOT – Gary Barber’s Wonder Gadot galloped a mile with rider Orlando Cross this morning during the 7:30-7:45 training period for Kentucky Oaks and Derby horses. Trainer Mark Casse said she will gallop 1 1/2 miles tomorrow. Casse said Monday morning that he would like a post position “somewhere in the middle” of the starting gate for the Oaks. Casse got his wish and said via text that he is “very happy” with Wonder Gadot drawing post five. KENTUCKY OAKS FIELD: The field for the Longines Kentucky Oaks with jockey and morning-line odds from the rail out, is: Sassy Sienna (Gary Stevens, 15-1), Coach Rocks (Luis Saez, 12-1), Classy Act (Brian Hernandez Jr., 15-1), Chocolate Martini (Javier Castellano, 12-1), Wonder Gadot (John Velazquez, 20-1), Kelly’s Humor (Irad Ortiz Jr., 30-1), Rayya (Van Dyke, 15-1), Heavenhasmynikki (Calvin Borel, 30-1), Take Charge Paula (Jose Ortiz, 15-1), Midnight Bisou (Smith 5-2), My Miss Lilly (Bravo, 10-1), Patrona Margarita (Ricardo Santana Jr., 30-1), Eskimo Kisses (Corey Lanerie, 15-1) and Monomoy Girl (Geroux, 2-1). All starters will carry 121 pounds. MONDAY (BY PLANE FROM IRELAND VIA INDIANAPOLIS) – Mendelssohn (Aidan O’Brien, 17).